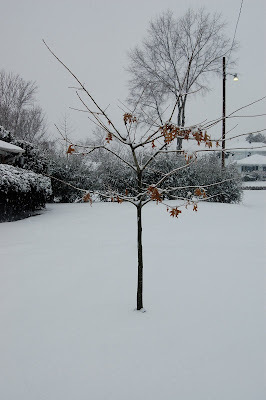 So, compared to the feetsies of snow in other, more northern areas of the country, I know our measly four-five inches might not seem like a lot, but here in the great state of Arkansas it is. Particularly because it wasn't predicted. I woke up around 2 a.m. (okay, let's face it I hadn't gone to bed yet. WHAT? I was reading! Remind me I'm not allowed to complain about being tired this week!) and peeked out the window to find the ground covered in fluffy white. This morning the sky POURED SNOW for a few hours. It was the beautiful, big fluff I remember from my childhood (youth? younger years? DAAAANG this is making me sound old!er!) - the fluff of snowpeople and red skin and hot chocolate and teeny marshmellows. I love fluff snow b/c it makes everything quiet and bright and you can hear the flakes popping against the hood of your jacket. I know all my Arkansas friends are laughing at me right now as they are reading this because I generally only complain (very QUIETLY as is my way) about snow. But I maintain that is because the "snow" we get here is generally more ice and of the half an inch variety and people really do PANIC like the world might end. Little Rock is apparently breaking accumulation records from, uh, forever ago and more snow is predicted throughout the week. In the six years (6 as of Feb 1!) I have lived here I can't remember this much. I'm going to attempt to enjoy it and try not to fret about the impending CABIN FEVER as pretty much every activity Nate and I have planned for the week has already been canceled! I agree! The snow was gorgeous-- giant white snow flakes... not the usual nasty ice/wintry mix we normally get. Arlo looks so very distinguished. Almost presidential. Cabin fever and I have resorted to giving out blog awards. Come get yours! Beautiful it was! Cabin fever to say the least!! This is the most snow in Arkansas since 1988. Seth said, "I remember that!" I was like, "WHAT?! We were 8!" Now who sounds old? !